ha ha ha! i think i'd find a cat desk attendant a little distracting! Please give BoB a tummy rub or a scratch behing the ears (whatever he prefers) from me. Hi Nic! He is a handsome fellow! I'd let him in my studio anytime. :) My cats like it when I sew, they love to mess up the material and get under it and kick it with their back legs. Also if I do anything with paper they come along and want to lay right over the top of it. Too funny! My dog does the same thing. She likes to sit and stare at me when I am working away on my designs! 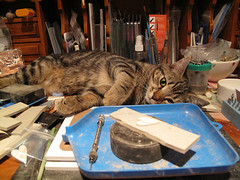 And what I love is the way the kiln gets rid of any evidence of the moggie audience (well so far anyway).